When we do data audits, we see this time and time again for organizations working in different areas and of differing sizes. So email fundraising is valuable and should be core to your online fundraising efforts. Today, I won’t go into all the things required for great email fundraising, like email acquisition, but rather focus on one thing: writing great fundraising email subject lines. There are many reasons why people don’t read your emails and one of the biggest is that they don’t even open them. The subject line can play a crucial role in changing that. Before we dive into some subject line ideas based on our research, we first have to understand how people are using subject lines. The subject line, along with the preview text, sender line, reply email, and date, is a key element of the ‘email envelope’ — what you see before you actually open the email. It’s the email envelope that you and I use, even unknowingly, to triage our inboxes. It can be tough for many nonprofits to appeal to the topic as it requires you to know a lot about the person you are sending to so you can be extra relevant. 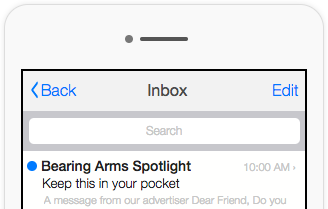 This is also why tools can be hit and miss in helping you write subject lines. Also, often, the topic you want to discuss, like clean water in Africa, may not be the most top of mind for the recipient. So instead I’ll focus on how you can appeal to the conversation. This method gives the reader the impression that the conversation itself is worth getting into without going into the topic very much at all — which relies on using conversational cues. This leaves people wanting to know more and invokes their sense of curiosity. Let’s take a look at an experiment we ran using mystery where the first email is from the founder of the organization and a frequent sender of emails. In it, she’s trying to be kind of cute and establish a connection through moms. The second is from another user on the site who hasn’t sent an email before. In it, she uses a personalized statement that doesn’t really say too much about what the email is. The end result: the second email got 137% more opens. Key Point: To activate the element of mystery, you need to leave just enough information out of your fundraising email subject line concerning the topic. The second email increased opens 71.6%. Now if you’re asking for money, it may seem like you aren’t offering anything but rather taking. If that’s your view of giving then fundraising is going to be hard as giving is a great gift that makes people feel happy and makes some kind of difference in the world. So there are two benefits you could feature in an email subject line: what they get in terms of happiness or what their gift does in terms of impact in the world. Key point: To activate the element of utility, you need to imply that there is something useful to them or their special interest: a benefit, a gift, content that progresses them, or even a favor. This is one of the most magical words in fundraising. Using ‘you’ has been a stable strategy for copywriting and particularly for direct mail for years. 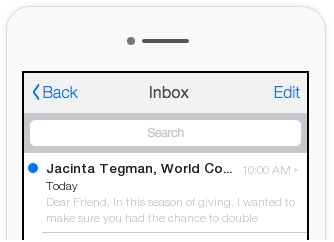 It’s a strategy that is still hugely useful for fundraising email subject lines. 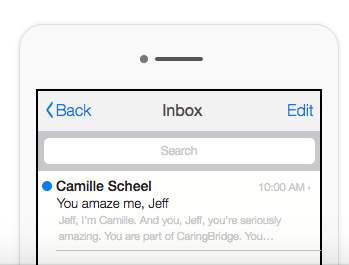 Remember the example from above for mystery with the “You Amaze Me, Jeff” subject line? That experiment shows the power of ‘you’ as well as how ‘you’ can be used with mystery. Key point: To activate the element of you, you need to imply that this email was made specifically for them, either by using the word “you,” using their name, or writing it so it feels personally addressed. This involves using time reliance and things like days of the week, time-based salutations, and words like ‘yesterday’, ‘today, and ‘tomorrow’. This helps increase the sense of urgency someone feels because it is time-based and when done right helps with relevance. Many emails you send are time reliant in one way or another — when you’re sending, what the content is about, when they need to respond, etc. — so just by adding in that fact can increase your open rate. Key Point: To activate the element of recency, you need to use a word that implies your email covers something recent and/or newsworthy. This is a hugely important factor as one of the main goals for your fundraising is to come across like a human talking to humans – not an email marketing machine. So when you get too ‘salesy’ or aggressive it can turn people off, not because you are being sales-y necessarily, but because it seems inauthentic. Key point: To activate the element of authenticity, you need to avoid phrases or word pairs that come off as opportunistic. If you want to send better emails and raise more money from them, you have to first get people to open your email. 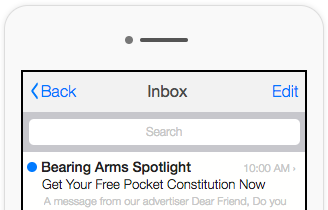 The subject line plays a critical role in that. By taking a conversational approach and using those 5 key levers, you have a better chance of standing out in a crowded inbox, having your donors engage with your content, and, possibly, going on to make a donation. You can download the free fundraising email subject line heuristic guide here that outlines these 5 levers and gives you some tips on what key words and phrases to use for each one. Want to go deeper with fundraising email subject lines, email envelopes, and more? Check out this free course on email fundraising. Originally published at www.neoncrm.com on April 11, 2018. 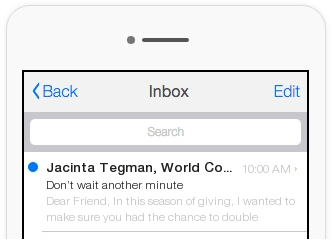 Subject lines, although incredibly powerful and influential, are only one small piece of a successful email. To make a big impact on your email fundraising effectiveness, you need to know how to optimize every element of your email. The free Email Fundraising Optimization course will walk you through each element of an email, show you what we’ve learned works through testing and optimization, and help you craft emails that will grow your online fundraising revenue.